I remember when “cook more” used to be a recurring item on my every New Year’s resolution list. I’m not quite sure when it finally happened – when I got to a place where I wasn’t only more comfortable in the kitchen but enjoyed the process. However, I’m pretty sure I didn’t get there during the first week of a January (more on timing and New Year’s resolutions in an upcoming post). Certainly, being able to hold my own and liking to cook (on most nights, anyway) was a journey. After prepping a few winners, I kept the dishes in rotation and built from there. The better I got, the more I dug it. Today, I still get stuck in the occasional rut but have a few dozen go-tos, love trying new recipes, and have surprised even myself with a new-found confidence to play with ingredients sans recipe. The key, in my experience, has been all about having healthy ingredients on hand so you can either (a) cook according to plan/recipe, or (b) wing it. Some ingredients, like the perishables will vary but in addition to the garlic, onion, ginger, etc., I do try to keep at least 3 or 4 seasonal veggies that are washed, chopped and ready to go. I stock non-dairy milks and creamers and sometimes, yogurt; and occasionally, I’ll pick up some fish or fowl to use that evening. 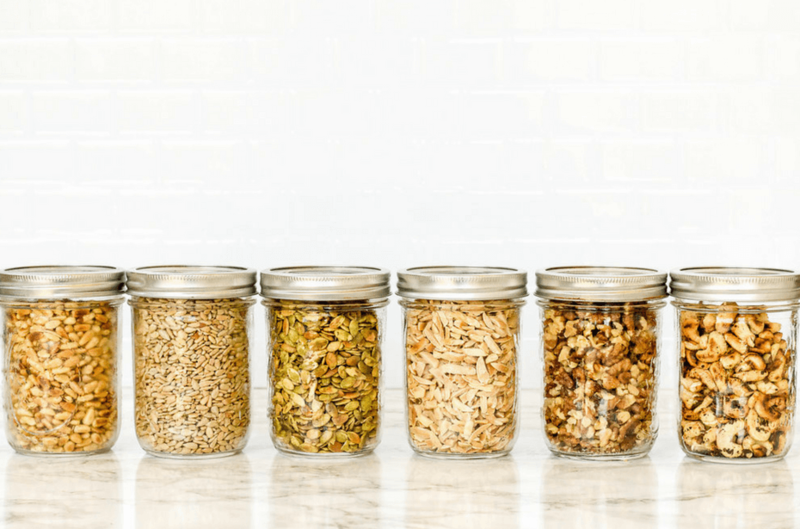 There are always some definites in my kitchen: affordable staples like grains and seeds, beans and other legumes so I’m able to prep a big batch of quinoa, brown rice or other grain (we also love farro, millet and bulgur) and/or a pot of beans at least once a week. I’ll then use them in several dishes. And, I store nuts in the fridge. What? You don’t store your nuts in the refrigerator? I didn’t either, until I found out it extends their shelf life for up to one year. During a recent Sunday, I loaded up on a wide variety of nuts and toasted them before storing in these pint-sized Ball jars. Toasted pine nuts, slivered almonds, walnuts, pepitas, sunflower seeds, pistachios and cashews are now all ready for the taking (OK, the cashews are almost gone). Toasting nuts beforehand isn’t necessary, but wow, does it enhance their flavor and even texture. I toast over medium heat in a saute pan, but you can also toast on a sheet pan in a 350 degree oven for 5-10 minutes. 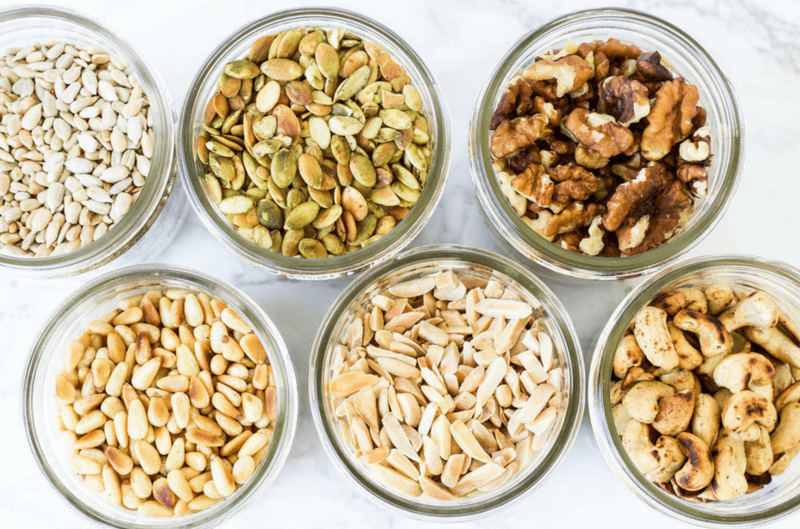 Nuts offer a great boost of fiber, protein, and healthy fats, and depending on the nuts, also a range of vitamins and minerals. 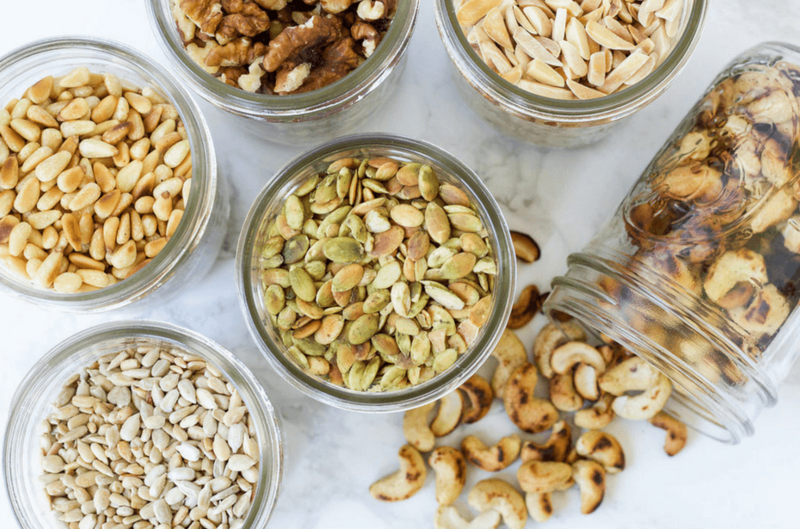 Having them on hand means snacks and meals are so much easier to put together, and adding nuts to a dish makes it seem like you are so put together. Use nuts to boost the crunch and nutrient level in oatmeal, yogurt or fruit, on a simple green salad, a grain salad, to top off soups, even tacos. The possibilities are endless and having nuts on hand – and toasted – is a kitchen hack must.